Study: Philly's 'livability' makes it second most undervalued city in U.S. Practically everywhere we look in Philadelphia in 2016, attractive new developments are on the rise and future projects call for expansive plans to build out the city's residential and commercial capacity. Trends of this kind are often indicators of a looming surge in the cost of living — West Coast cities are the nation's prime example in recent decades — but a new study finds that Philadelphia and two other Pennsylvania cities are among the top ten most undervalued in the United States. In an analysis of the "livability" of more than 200 large American cities, real estate data crunchers SmartAsset determined their rankings based on a model that projects a city's home value per square foot relative to its desirability. This includes factors such as a city's employment market, weather, crime, high school graduation rates, walkability, and quality of dining and entertainment establishments per 100,000 residents. With improving unemployment numbers, a top ten public transportation system, and an excellent layout for biking and walking, few would argue that Philadelphia isn't an increasingly desirable city to live in (or simply visit, for that matter, as a preview of the lifestyle). Still, SmartAsset found that the home value per square foot in Philadelphia (about $92) falls significantly short of the $228.06 predicated by its model based on the factors noted above. That means those who live here tend to get much more bang for their buck than those who live in other desirable American cities. The analysis is based only on quality of life metrics and does not account for the rate of new home construction, the relative cost of rentals and the rate of population change, which has slowed a bit in Philadelphia despite continued growth. Without taking these factors into account, it's difficult to predict whether the cost of living in a given city will rise or fall. Compared to the rest of the United States, however, Pennsylvania cities stand out for their cost relative to the quality of life they offer residents. Pittsburgh, Philly and Allentown all made their way into the top ten. 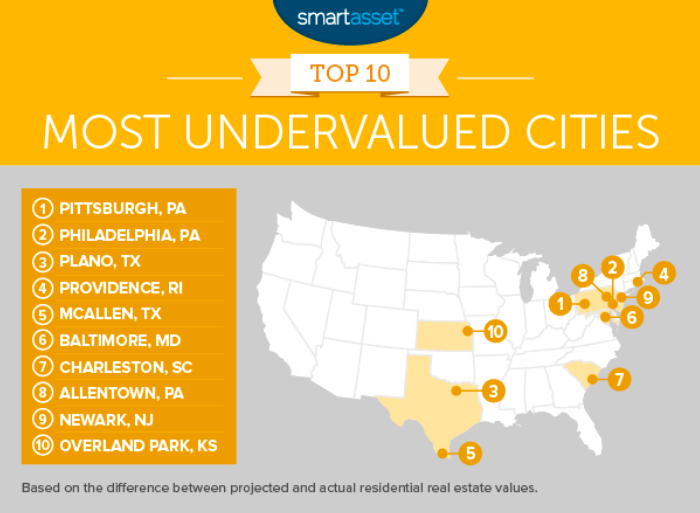 SmartAsset's top ten most undervalued cities in the United States. In Philadelphia, the flipside of this analysis is that the city's demographics could pose a challenge to future home ownership. A recent poll of millennials in Philly found that while 75 percent eventually want to purchase a home, 79 percent said they can't afford to do so. Those who can have been more deft at flipping them for profit than settling down in them. Fortunately, despite Philadelphia's emergence in several growth industries, the city has managed to avoid the kinds of issues that are pricing people out of places like San Francisco and Seattle. The latter, for example, has been wrangling over whether and how to implement mandatory inclusionary housing and commercial linkage fees that would funnel money into affordable housing projects. For the time being, it's worth appreciating the fact that Philadelphia has preserved and developed so much to offer without driving away residents who can't afford to stay here.